Rene Descartes’ simple statement, “I think, therefore I am,” shaped philosophical dialog from his time forward. It is possible — logically — to question the existence of everything, and philosophers seem to enjoy doing it. Descartes proposed that the act of rationality required for doubting proves the existence of the doubter. The undeniability of the doubt provides a basis from which to infer the reality of the world, and a foundation for truth itself. I’m sure not many of us have felt a need to prove our existence or that we or the world itself are real, but the question does come up in popular media. Are we just dreaming? Or, are we being dreamed? Are we delusional, insane, hallucinating? Can we count on our sense perceptions? What is the difference between a “real” human being and an android? Will the advance of artificial intelligence force us to rethink reason? That was my first encounter with post-modernism, though I did not even know the term. Now, it is the water we swim in. The big questions are still there: What is true? What is real? How can you know? But there is no more confidence that we can find the answers with our senses and our minds. All we have now is consensus, the way most people see things, or the way the most influential people see things. In the absence of truth there is just perspective, and the power to enforce it. But there is one thing that we can’t so easily dismiss. Pain. We can tell ourselves that it is not real, that it is an illusion, just like everything else. But when they are really hurting that does not help most people. Try telling a yourself a toothache or a kidney stone or a bad case of epididymitis is an illusion. Our bodies can be pretty insistent and they may be our salvation. It is almost impossible to deny the reality of pain, partly because it is impossible to do that kind of philosophical gymnastics when your body is really hurting. That part of the brain just doesn’t work except under fairly congenial physical circumstances. When truth hurts it is hard to deny, even if we don’t believe in it. The late Dallas Willard, former chair of the philosophy department at USC, and fervent Christian, used to quip: “Truth is what you run into when you are wrong.” And it is often a painful encounter, as when you stub your toe on the coffee table in the dark on your way to the kitchen. The existence of the coffee table was no longer theoretical. There are true and false answers to the question, “Where is the coffee table?” And there are real consequences when our “perspective” about its location is wrong. Trivial mistakes like the location of the coffee table are addressed through a very short feedback loop. The information is transmitted from foot to brain and back to foot in nanoseconds. The same thing happens with the finger on the hot stove. Thanks to our lightning fast reflexes we get away with a blister instead of charred flesh. What about the other things we get wrong, things that really matter? Now that I am well past mid-life I wish the more important things in life had shorter feedback loops. We can be wrong for a long, long time and do lots of damage to ourselves and others, and not know it for 30 years, too late for any correction to make much of a difference. I guess this is the job of the conscience, but mine is not as loud as I might have wished. Why can’t it be as unignorable as my little toe?! If you are wrong about something, how soon do you want to know it? How will you feel about someone who helps you realize it? We know the rational answers, but there is another factor, isn’t there? The painful consequences of being wrong are usually in the distance. The pain of admitting we are wrong is all too present. Wounded pride hurts right now. And then there is the pain of making changes. Missionary physician, Paul Brand, spent the bulk of his career working with leprosy patients in India. Leprosy is primarily a neurological disorder. Lepers lose feeling in their hands and feet. They hurt themselves without knowing it. Rats can chew their toes in the night without waking them up. Cuts and scrapes accumulate without the constant minute feedback we rely on to coordinate our movements. The sores and infections and tissue degradation we associate with leprosy come from the absence of pain. The title of Dr. Brand’s book says it all. “Pain: The Gift that Nobody Wants.” We seldom regard pain as a gift, but without it no animal can survive. Pain is a universal human experience. Philosophies and religions vary widely. Same with temperament and intelligence and culture. But we all feel pain, physically and emotionally and spiritually. And we all hurt in remarkably similar ways. We are vulnerable creatures in a dangerous world. And we are creatures with deep longings that this world cannot fully satisfy. The fact that it sometimes comes close to satisfying them only makes it worse. For C.S. Lewis this reality served as a pointer to God. If human beings have longings that this world cannot fulfil it may be that we were meant for another world, ultimately. Here we thirst, and there is water, we hunger, and there is food. But what of the longings of the heart, that undeniable sense that there has to something more than this, even when on the surface it seems that every need has been met? Such desires are invitations to lift our eyes above the horizon. And to question those who would tell us that we are just a bundle of random molecules. Descartes was convincing in his day. But pain may in fact be the ultimate proof of our existence. “I hurt, therefore I am.” I desire so much it hurts, therefore I am.” God has made us for a kind of life that can be only partially realized here on earth. And pain tells us that this earth is not exactly as it should be. Something has gone wrong. Both pains are invitations. Of course, past a certain point of intensity such attempts to make sense of pain fall short. Lewis found this so in his bereavement over his wife’s death. It overwhelmed even his formidable rational capacities and he was undone. He wrote about it honestly, and some think he may have lost his faith at least for a while. No answer to the problem of pain even approaches adequacy that does not include what we are promised in Scripture: a new Heaven and new Earth, where all things are put right and every tear is wiped away, where every pain becomes a distant fading memory, if that, and all is caught up in a quality of life and joy and fulfilment that goes beyond our imaginations. In the meantime we hold on, and we experience pain and longings, and we try to learn from them. Hopefully we turn toward God in the midst of them, and not away. It’s better for us if we do. But it is OK to ask questions, like Job. In fact that may be the most important thing we can do. This could seem harsh. Most of us legitimately struggle with the idea of a God who allows pain. But what would become of us if our existence in a world that has turned its back on its Creator were not painful? Like lepers, what damage might we do to ourselves and to others? But sometimes all we get is the reminder that, for now, we too are part of something that has gone badly wrong, and we are not exempt from the wrongness. We get an inkling that the arc of God’s redemption extends beyond the horizon of our life-times, and the limits of our imagination. And then we add our puzzled tears to the groaning of creation (Rom 8:19-23) in hopeful anticipation of the Day when all things are made Right and New. What’s Up With All This Zombie Stuff? This video offers a sobering interpretation of our cultural fascination with Zombies. 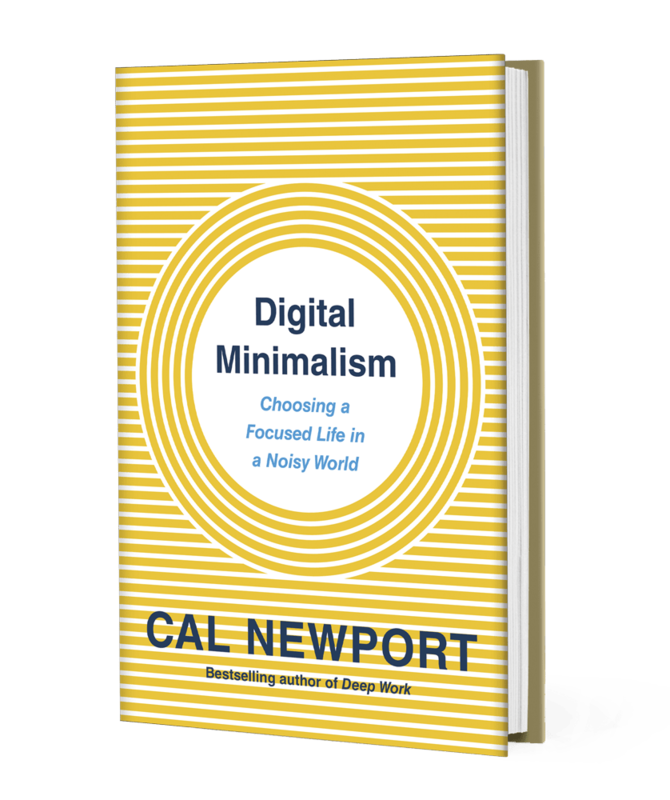 I am almost finished reading Cal Newport’s new book, Digital Minimalism: Choosing a Focused Life in a Noisy World. I highly recommend it. Our attention and time are valuable commodities to merchants in this line of work. Imagine, they make their money selling a product we give them free of charge! That’s a pretty sweet deal. All they have to do is find ways to hold our attention, and every second is gold. Apparently, the first American to figure this out was Benjamin Day, publisher of the New York Sun in 1830. Before that, the newspaper business model depended on providing a product of sufficient quality (reliable news) that people would be willing to pay for it. Day discovered that the real money was not in selling news to the reader, but selling readers to the advertisers. He found he could sell his paper to the readers at a loss, because he was selling their attention to his advertisers. Well, that’s what is happening all around us. Just look at the margin of your screen! We imagine that we are the customer. Not really. We aren’t the customer–at least not yet; we are the product. Our attention is being sold at a handsome price because the folks that buy it think they can get us to buy what they are selling. So we are getting had twice! How does that make you feel–being both the product and the “mark” in an elaborate con? Perhaps you think, “I already know all this. What’s the big deal? I see through it. I’m getting what I want–news, information, entertainment. I even like some of the ads.” They hope you do. What strikes me in all this is: 1) The advertisers are turning our passive attention into action–the action of buying. That’s a pretty amazing feat. 2) Even when we know and accept the game, we are still being trained, “groomed.” They are playing the long-game, not just getting us to buy a particular product, but forming us into a certain kind of person. Whatever gets our attention gets us. I doubt the attention merchants got their strategy from the Bible, but they could have. There are multiple warnings in Scripture about guarding our hearts and minds, being intentional about where we direct our thoughts, what we meditate on (Psalm 1). Seeing the attention economy all around us sheds new light on Paul’s warning that we not be conformed to this world but “transformed by the renewing of our minds” (Romans 12:1-2). Colossians 3:1-2 says: If then you have been raised with Christ, seek the things that are above, where Christ is, seated at the right hand of God. 2 Set your minds on things that are above, not on things that are on earth. This requires definite, intentional action on our part. All they need for their scheme to work is our passive attention. To break free and redirect our attention takes active effort — often quite a bit, depending on how far we have let our muscles soften. They have the “gravity” of laziness on their side. But they do not have to win. There truly is a battle for our attention, and our souls. Don’t give it away for nothing to people whose primary objective is to manipulate and milk you for all they can. Direct it toward the One who wants to give you Abundant Life, now and in the age to come. Are you giving your attention to Someone who loves you and can give you Life in return, or to those who want only to exploit you for their gain? We feel sorry for people who allow others to exploit their bodies for profit. Many people are deeply committed to ending human trafficking. Rightly so. But is our attention less valuable than our bodies? We vigorously defend our bodies, yet passively surrender our minds. We are ever more aware of how would-be predators groom children for sexual abuse. Are we as cautious about those who are seducing their minds? Is the attention of our children less valuable than their bodies? It is actually far more valuable. Their attention is the pathway to their souls. If attention merchants get their souls, of course they get their bodies too, eventually. Action step: Keep track of what you give your attention to, what you look at and listen to, and for how long. See what you think. If you have kids, observe their engagement with the media. Try making some adjustment to that engagement. Observe the results. In the Garden of Gethsemane, the disciples went to sleep when they should have stayed awake, and once they realized what they had done it produced despair. The sense of having done something irreversible tends to make us despair. We say, “Well, it’s all over and ruined now; what’s the point in trying anymore.” If we think this kind of despair is an exception, we are mistaken. It is a very ordinary human experience. Whenever we realize we have not taken advantage of a magnificent opportunity, we are apt to sink into despair. But Jesus comes and lovingly says to us, in essence, “Sleep on now. That opportunity is lost forever and you can’t change that. But get up, and let’s go on to the next thing.” In other words, let the past sleep, but let it sleep in the sweet embrace of Christ, and let us go on into the invincible future with Him. There will be experiences like this in each of our lives. We will have times of despair caused by real events in our lives, and we will be unable to lift ourselves out of them. The disciples, in this instance, had done a downright unthinkable thing— they had gone to sleep instead of watching with Jesus. But our Lord came to them taking the spiritual initiative against their despair and said, in effect, “Get up, and do the next thing.” If we are inspired by God, what is the next thing? It is to trust Him absolutely and to pray on the basis of His redemption. Contemporary worship can be sound and substantial. By list’ning for your truth upon each page. Of new creation. How will others hear? And listen for your footfalls as you lead.